My understanding is that the language is very difficult to learn (it doesn't resemble any other European languages except maybe Finnish). Thankfully, everywhere we went, people spoke at least a little English. 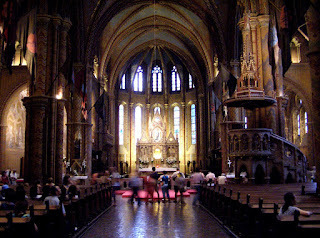 Inside, I got the first taste of how different culturally and historically Hungary is compared to, say, Germany. Everything is decorated. 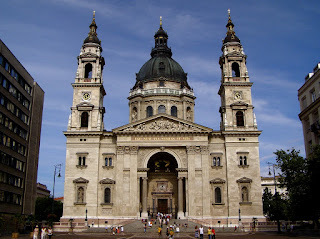 Inside the Church is St. Stephan Chapel, dedicated to the first king of Hungary (crowned in the year 1000, and canonized after his death) with a replica of the crown of St. Stephan (used to crown the kings of Hungary from the 13th century). The real crown is in the Parliament (which we never got to). His mummified right hand can be found in St. Stephen's Basilica (which I'll get to later). The text around the replica of the crown of St. Stephan tries to very carefully prove that the real crown can be dated back to St. Stephan and somehow divines that it was originally crafted on the shores of the Black Sea in the 3rd century. 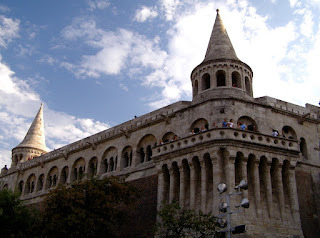 Outside the church is Fisherman's Bastion; it's pretty cool to look at. We were exhausted by the end of the afternoon. Luckily, a quick dinner could be had on the Chain Bridge, shut to cars for the weekend, it was lined with stands for food and trinkets, with stages for music on either end, and tourists everywhere. Here's a picture of it all lit up. On the second day, we went to Pest to the Jewish quarter and saw Dohány Street Synagogue, the second largest synagogue in the world. 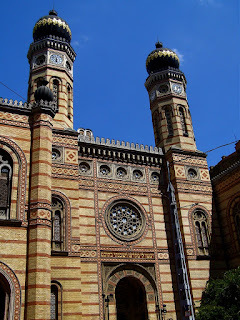 By the way, if you're looking for a bathroom in Budapest, you don't need to pay to use the bathroom in the synagogue (it's before the ticket-takers). 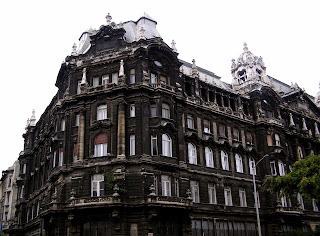 Also, the Inter-continental Hotel near the Chain Bridge (on the Pest side) has a side door right next to its lobby bathrooms. 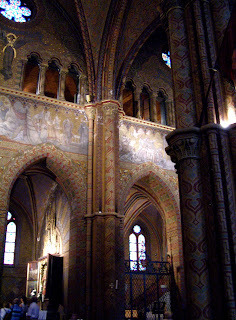 The inside was pretty amazing, but you need to buy a separate ticket to take pictures; there's a bunch on the Wikipedia page I linked above. 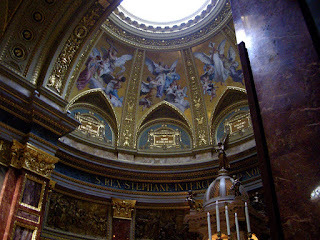 After lunch, we went to St. Stephan's Basilica; the most ornate building in the world (okay, maybe not officially ...). After a good look around and at St. Stephan's mummified hand, we went to the roof (not the to top of the dome but very high). That's where the fourth photo in this post was taken. 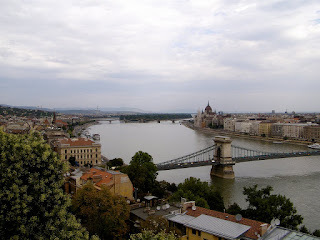 After this, we walked along the river, past the Parliament to Margaret Island and relaxed for the rest of the day. 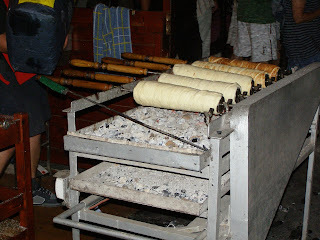 A quick dinner in front of the Basilica was capped off with one of these tubes of grilled sweet bread (-like thing) coated in caramelized vanilla sugar bought from a stand on the Chain bridge. We ate it standing by one of the stages which featured some rather good music (I'm blanking on what kind of music it was (jazz?) and only remember that I liked it). The last day was cold and rainy (it was hot the previous two days). 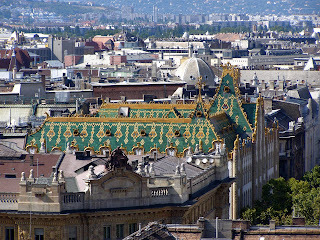 We wandered up Andrássy út to City Park and went to the thermal baths there, Széchenyi Medicinal Bath. 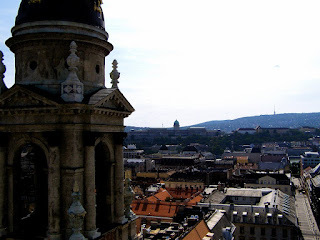 Budapest is known for it's thermal baths and we could have spent several more days just exploring all of them. After going through a rather complex procedure for paying, getting a locker, changing, and getting towels, we relaxed in their many outdoor thermal baths and indoor herbal baths. It was fantastic, especially after two and 1/2 days of nothing but walking. After a few hours of soaking, we got some afternoon cake (there's a lot of really good afternoon cake in Budapest) and wandered down Váci utca, the main touristy, pedestrian street, stumbled upon a great deal (and good food) for dinner and called it a day. 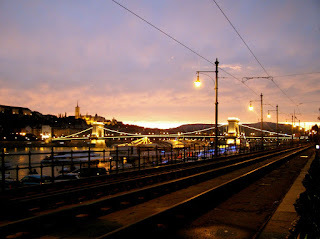 All in all, Budapest was pretty awesome. I definitely could have used several more days just to get to all the places I wanted to see and two or three history books to figure out what it was I saw. 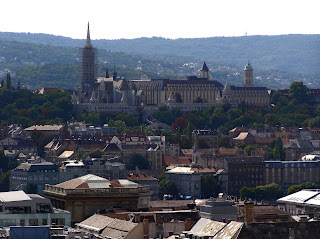 Yay Budapest! I also really loved the city when I visited. I think I was pleasantly surprised that it wasn't the grey, soul-less Soviet barrack that I had pictured (although I hear that is what Bucharest is like). Did you ride the subway while you were there? The one thing I remember was that the escalators down to the platform go about 50% faster than in the US and people openly stare across at each other while riding them. We walked by the thermal baths, but didn't go in -- so now I'm jealous. But we did make it to Parliament and saw the famous flag with the hole cut out of it from the 1956 uprising. Oh also, didn't you have plans to visit all the microstates of Europe? How's that going? Liechtenstein! Tim - We took the subway only once (from the thermal baths back toward the river) and all I really remember is how good I felt after soaking in 38 C water for 3 hours and how happy I was not to be walking. And we really did mean to go to the Parliament; it just somehow slipped away from us. As for the microstates, it's not looking so good right now. Sean's visit is halfway over and our microstate count stands at zero. But don't worry about us: we drowned our sorrows in lots of Belgian beer.